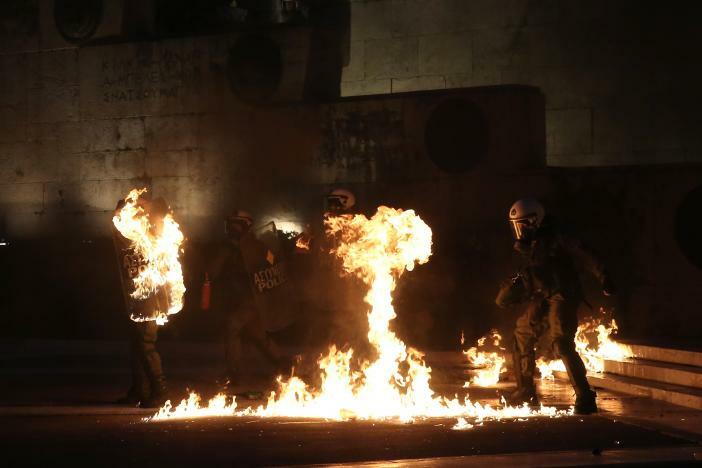 Shortly before Greek parliament voted for new austerity measures, clashes broke out in Athens on Thursday night. It was the second day of clashes in the Greek capital. Read the Update below the report we published this morning. Just one day after short but intense clashes during the general strike, clashes broke out again during anti-austerity protests in the Greek capital. The protests started in the early morning hours when pensioners braved heavy rain and marched to parliament to express their anger at the latest planned cuts to their incomes. “No more tax theft,” they chanted. Pensions have been cut sharply over the past seven years as successive Greek governments have slashed spending to save the international banking industry. Despite serious transportation problems due to strikes and subway station closures thousands of people gathered in front of Greek parliament in the evening hours. Shortly before parliament voted on a new round of austerity measures, a group of anarchists tried to enter parliament. They climbed the stairs towards the parliament building. Like the day before, short but intense clashes broke out. Riot cops prevented the anarchists to reach parliament, but were attacked with molotov cocktails. Black Bloc activists set one of the Evzones guards posts in front of parliament on fire. The Evzones are guards on 24-hour basis in front of the Monument of the Unknown Soldier.Cops arrested at least one person and detained two. According to the cops they were found to be in possession of a hammer and an axe. During similar protests in Thessaloniki people beated a cop and set his motorcycle on fire (video below). A flag of the European Union was set on fire as well. As expected a majority of Greek parliament voted with yes to new austerity bill. The wannabe leftwing Syriza party betrayed the people once again. “We won’t live like slaves – The only lost battles are the ones that they have not been given”. On Thursday 18 May 2017 thousands of people joined a 2nd day of protests following a general strike all over Greece on the day before, against the new harsh austerity measures of 4.9 billion euros incorporated in the 4th Memorandum signed by the greek government, aimed once again against the lower income classes rather, than the banks and the wealthy. The self-proclaimed left government of SYRIZA in co-operation with the right wing party of ANEL have unleashed a new class war, this time specifically aimed against people with disability and pensioners that have worked all their lives and paid their share under the false notion -as it seems- that during the time when they will be most vulnerable, they would have free public health services and subsidies that would help them get by. On the contrary after 23(!) severe cuts in pensions and allowances during the 8 years of the financial crisis in Greece (amounting to more than 50 billion euros in pension and allowances cuts during the last 7 years), that has forced people to live like beggars, a further 18% cut will be imposed on pensions under the 4th Memorandum voted in the greek parliament on Thursday 18 May 2017 and a “freezing” of even the slightest raise in pensions until 2022. And as if a life with no future wasn’t enough, the streets of Athens were filled with thousands of riot policemen to impose fear on people daring to protest. During the protest in Athens anarchists tried to storm the Greek parliament and attacked the riot police brigades on the stairs leading to the front yard of the building -that once was purported to be the royal palace in Syntagma Square- whilst inside politicians were voting on the new harsh financial measures to be imposed on the people, without the people.